My fourth cookbook project has come to a close. 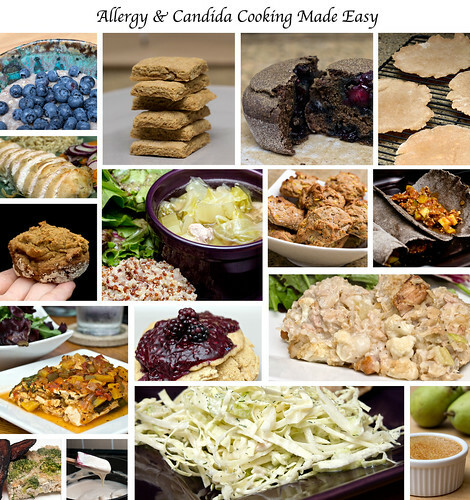 Allergy & Candida Cooking Made Easy was a cookbook recommended to me by my Environmental Illness doctor to give me some ideas of things to cook to help my battle with candida. I have to admit I wasn't all that thrilled with the cookbook as a whole and there were only a couple of recipes I might consider making again. The cookbook is based on a 4 day rotational diet plan which I started following based on my doctor's recommendations. It was after I found Bee's program that I stopped that diet and started following that one which doesn't allow grains of any kind, including gluten free grains. Below is my list of likes and dislikes about the cookbook. As I write this I realize there are a lot more things I liked about the cookbook than I originally thought. I was quite pleased with the baking section. Most of those turned out very well. Each of the baking recipes had multiple variations of the recipe using different types of flours and oils. Each recipe had nutritional info provided. Most of the recipes were very easy and didn't take a lot of time to make. Not just a cookbook, it also contains a lot of information on Candida and allergies as well as a section on food properties, history and uses. Most of the main dish meals were not very flavorful, very few spices are used besides salt and pepper. No pictures of any of the dishes. The price. It's not a cheap cookbook. The new price on Amazon ranges from $60-$296 which is just crazy. The price on the back of the book is $29.95 I was not going to pay that much so I bought it used for about $20.